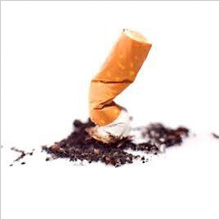 Linda has experience to help you quit smoking using Hypnotherapy, so call Linda today. Stopping smoking with hypnotherapy is quick, effective and a positive experience. You must be committed to stopping smoking as hypnotherapy cannot make you do something against your will. Amethyst Therapy focuses on the positive effects of being a non-smoker, better health and more energy. At the first session I explain how Hypnotherapy works and we make a date for your Stop Smoking session, which will be the date you decide to become a non-smoker. Almost every smoker, over the years, becomes psychologically conditioned to believe they need to smoke. Hypnotherapy allows your therapist to support you to overcome this conditioning. “Lack of Will Power” a “Chemical Addiction – Nicotine” and “Fear”. The one simple reason that you have not stopped smoking is that you fear that it is going to be too painful and too difficult. *The fact is hypnotherapy can make it easy, and in most cases after only one session. You’ll leave a happy non-smoker – not feeling deprived, not feeling that you’ve made a sacrifice and not feeling any pain. Instead, you’ll have a huge sense of relief and elation that you have at last achieved what all smokers long to achieve, you have become a happy non-smoker. All Benefits Are Lost When you start Smoking Again! Please view the Contact page and call now for further information and to book your session!